Could you benefit from switching DNS Server? A DNS (Domain Name System) server is used to lookup the address you type into the address bar and link it to an IP address of a system. The speeds at which the pages are delivered to you from different servers are varied. 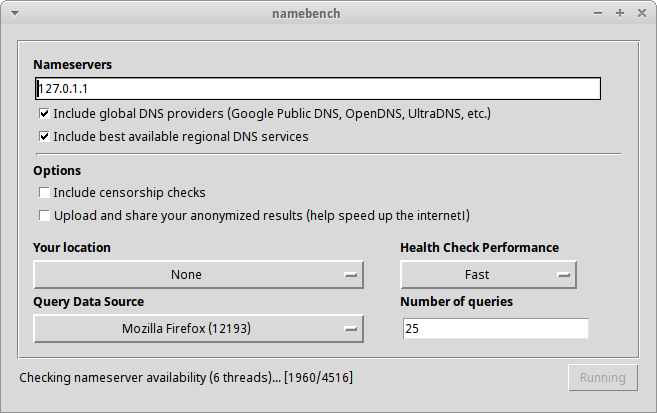 According the the namebench tool I could gain 34% by switching to google’s 8.8.4.4 DNS server. Here is a quick guide to finding out on a Ubuntu system. Start the benchmark with the default settings. When it is complete it will display a web page with your results. If everything works … Great! You are done, go ahead and browse the Internet, see if it makes any difference. This entry was posted in linux, Tutorial and tagged DNS, Faster Internet, Internet, server, Switch DNS. Bookmark the permalink.